Watch me write an IELTS Writing Task 1 report, on screen, about a bar graph. You will see and hear my thought process as I write. I talk about the bar graph, and then I plan the essay, thinking out-loud the essay structure and language I should use. Then watch and listen as I write the essay! Below the video you can see the task details, and further down the page you can see my finished report. The bar chart illustrates the gender distribution of students pursuing scientific research across a range of disciplines at an academic institution in the UK in 2009. Overall, the chart shows that at this particular university, science-related fields are dominated by male students; however, women have a significant presence in fields related to the study of life sciences and medicine. In 5 of the 6 disciplines, male students outnumber women. Men are by far the dominant gender numerically in the physical sciences: physics, astronomy and geology. Male students were overwhelmingly in the majority in physics, where they outnumbered women by a margin of about 6 to 1. Men and women were more equally represented in subjects related to the study of living things: biology, medicine and veterinary medicine. In biology, for instance, there were nearly as many women (approximately 200) as men (approximately 240). This was also true in medicine. Interestingly, veterinary medicine was the only field in which women formed the majority of the student body. There were roughly 120 female students as opposed to around 90 male students in this field. 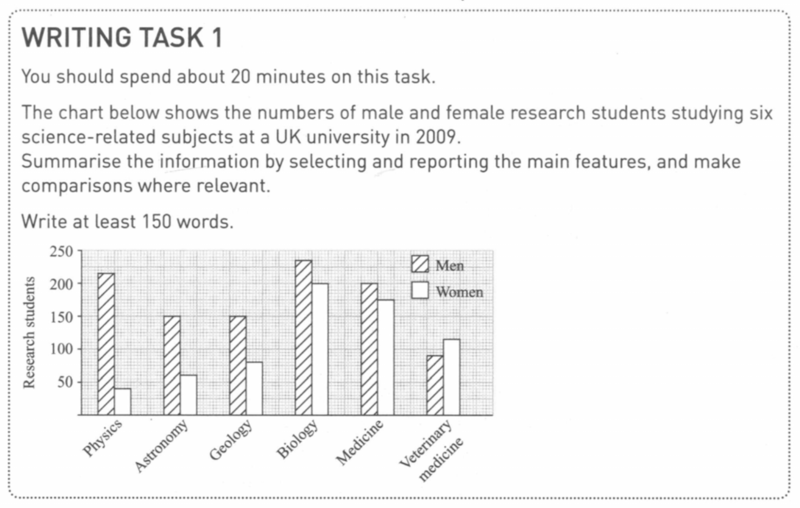 The chart below shows the numbers of male and female research students studying six science-related subjects at a UK university in 2009. I hope you found the video useful. If you think other people will like the video, please share it. And if you have any questions or comments, please add them below. Posted in IELTS Writing, IELTS Writing Walkthroughs and tagged IELTS, IELTS preparation, IELTS Writing, IELTS Writing Task 1.